April 21, 2011, 12:45 p.m.
By Joshua Benton @jbenton April 21, 2011, 12:45 p.m. The New York Times Co., as part of its earnings announcement today, gave the first concrete numbers for its new digital subscription offerings, noting that “paid digital subscribers have surpassed 100,000” in the three weeks since global launch. (Canadians had a one-week head start.) The Times itself has reported that the goal for year one of the paywall is 300,000 subscribers. The general reaction around the web seems to be “Not bad!” (“This is encouraging,” “pretty impressive,” “very encouraging,” and so on.) But the most important question, I think, is one we’re not any closer to answering: not where that number is today, but what the growth curve will look like over time. And the Times’ past experience with charging for content shows that’s a harder nut to crack. Let’s say that those 100,000 subscribers stick around. (Note that they’re currently paying heavily discounted introductory rates — 99 cents a week instead of the $3.75 minimum they’ll have to pay when their offer runs out.) If we guesstimate an 80/20 split between the cheapest and most expensive pricing packages, that would generate almost $25 million a year in new revenue for the Times. Now, that’s not $25 million in new profit — the paywall costs money to run and market — and it’s still small in the context of a company that generated $566.5 million in revenue just in the last quarter. It’s something, and climbing revenue is better than declining revenue — and of course if that 100,000 number grows, even better. The chief of the New York Times’ digital operations said he is “delighted with the enthusiastic response” to the company’s subscription package offering access to editorials, opinion pieces and columnists, as well as the paper’s archives. TimesSelect is priced at $49.95 for a year and $7.95 a month. Martin Nisenholtz, a Times senior vice president, reported that TimesSelect has signed up 270,000 subscribers in the two months it’s been available. Half the number represents home-delivery customers who get the package included with their print subscriptions. So of the 270,000, half — 135,000 — are digital-only paid subscribers, the closest equivalent of the 100,000 number the Times announced today. That was after two months of TimesSelect. Comparisons between TimesSelect and the new system are always imperfect. One only affected a small portion of the Times’ content; the other affects nearly all of it, but only for certain users who consume it above certain quantities and through certain channels. One had a flat and relatively low price; the other has a menu of options, all more expensive than last time. And the environment for paid content in 2011 is different from 2005’s in lots of ways. TimesSelect had about 227,000 paying subscribers as of August. People who receive the paper at home get access to it for free, as do students. In total, about 787,400 people have access to TimesSelect now, the company said. 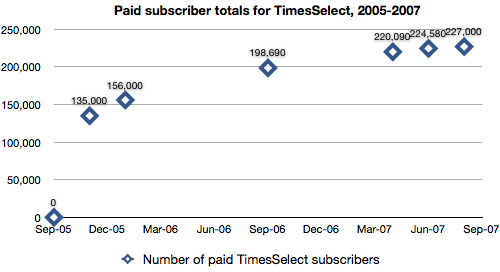 So, from September to November 2005 — in the first two months — the Times signed up 135,000 subscribers to TimesSelect. Then, between then and September 2007 — 22 months — it signed up only another 92,000. We actually have a few other data points. In January 2006, the number of paying subscribers was 156,000 according to Editor & Publisher. In September 2006, the number was 198,690. This MediaPost article quotes 220,090 in April 2007 and 224,580 in June 2007. These are the people who love the Times and have no problem ponying up a few bucks a month as soon as they’re asked, both because they see the value in the paper and out of a civic-minded spirit. (I’m one of them!) They’re the primary target of the Times’ paywall efforts past and present. The problem is that there are only so many of them around. And TimesSelect, at least, had a difficult time getting a lot of traction beyond them — with subscriptions increasing by only about 7,000 in the last four months. Now, there’s no reason the new digital subscriptions have to follow the same course as TimesSelect. The metered model, with its unusual correlation to the calendar month, will mean that many readers will hit the paywall inconsistently, and I wouldn’t be surprised if the subscriber numbers weren’t on as smooth of a time curve as TimesSelect’s were. But the last time there was a rush of people wanting to pay for nytimes.com, it was followed by a long plateau of slow growth — and eventually, by Times executives deciding that the lost advertising revenue (plus the mistaken public perception that the entire paper was behind a paywall) was too big a price to pay for its strategy. 2011 isn’t 2007, but the only way we’ll learn how this time is different is to wait it out. POSTED April 21, 2011, 12:45 p.m.
Benton, Joshua. "A New York Times TimesSelect flashback: Early numbers are nice, but growth over time is nicer." Nieman Journalism Lab. Nieman Foundation for Journalism at Harvard, 21 Apr. 2011. Web. 19 Apr. 2019. Benton, Joshua. "A New York Times TimesSelect flashback: Early numbers are nice, but growth over time is nicer." Nieman Journalism Lab. Last modified April 21, 2011. Accessed April 19, 2019. https://www.niemanlab.org/2011/04/a-new-york-times-timesselect-flashback-early-numbers-are-nice-but-growth-over-time-is-nicer/.